From its inception at Burning Man to a fixture on Alberta Street, Frock has become one of the most unique stores in Portland for clothing, gifts and one-of-a-kind treasures. 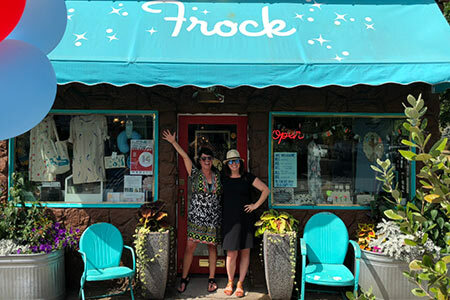 Last month, Frock celebrated its 15th anniversary, and this month begins a 1,000-square-foot expansion. Co-owners Angie Heiney and Ali Wykhuis met in Portland in 1997 and have been friends ever since. Ali has a bachelor’s degree in apparel design and Angie has a master’s in business administration. Their talents brought them together, and their inspiration for Frock was ignited at Burning Man. From 1999 to 2002, they attended the event in the northwest Nevada desert and spent thousands of dollars of their own money creating a vintage clothing store that quickly became one of the most popular boutiques at Burning Man. “It was a huge privilege because we were contacted by Burning Man’s organizers to be a partner in the center camp,” Angie reported. The crowd was treated to a shop filled with mannequins dressed in fanciful costumes, vintage clothing, accessories and wild decor. In the Burning Man “gift economy” tradition, Angie and Ali gave everything away. The following year, Frock opened its doors on Alberta. “It’s like a curated collection of things that represent the Alberta vibe,” Ali said. Walking into Frock is like being swept away at a carnival. You’ll find everything from off the wall accessories to modern and eclectic clothing mixes. Who doesn’t need platform shoes with a garden party in the sole? The Frock ladies owe their long-term success to shared business goals. They let each other try out new ideas and foster a nonrestrictive philosophy. What started out as radical self expression and a costume mindset has evolved into complete fashion insanity and their customers love it.